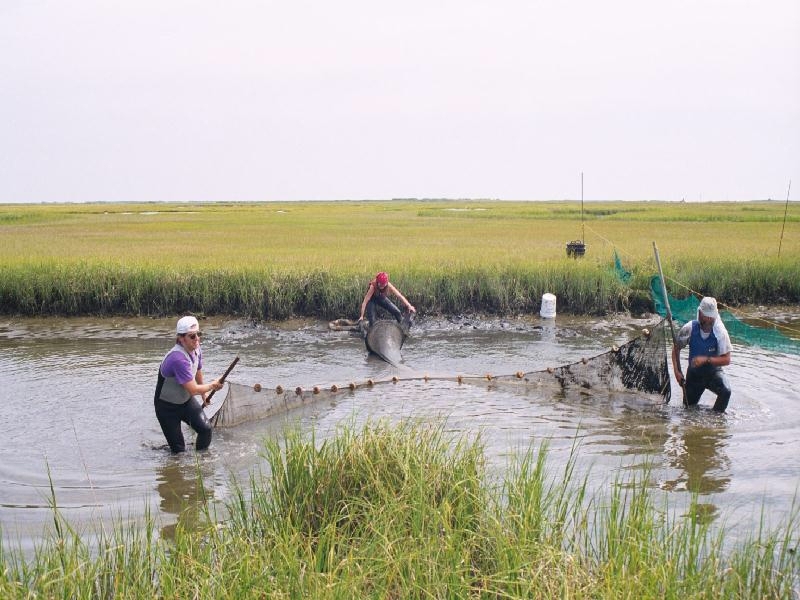 Patterns of ontogenetic shifts in nekton habitat use along a marsh coenocline: Atlantic silverside case study. 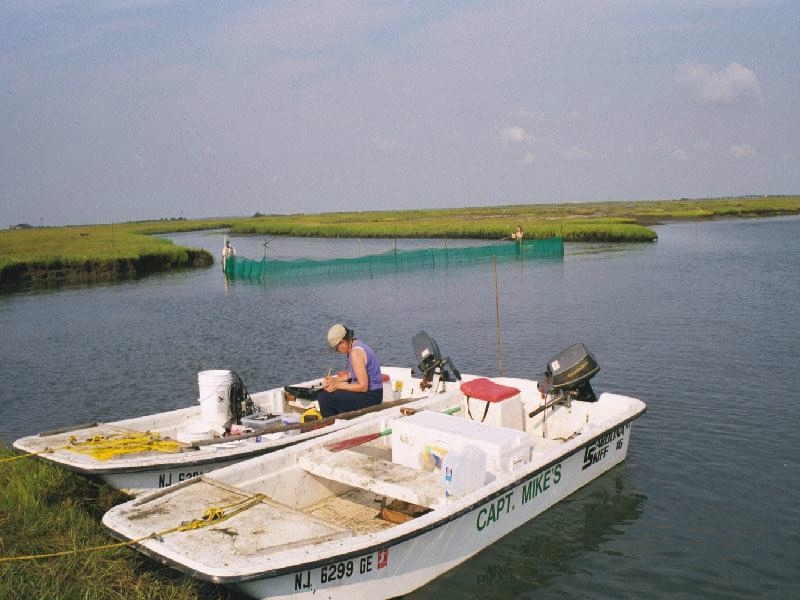 Project title: Patterns of ontogenetic shifts in nekton habitat use along a marsh coenocline: Atlantic silverside case study. 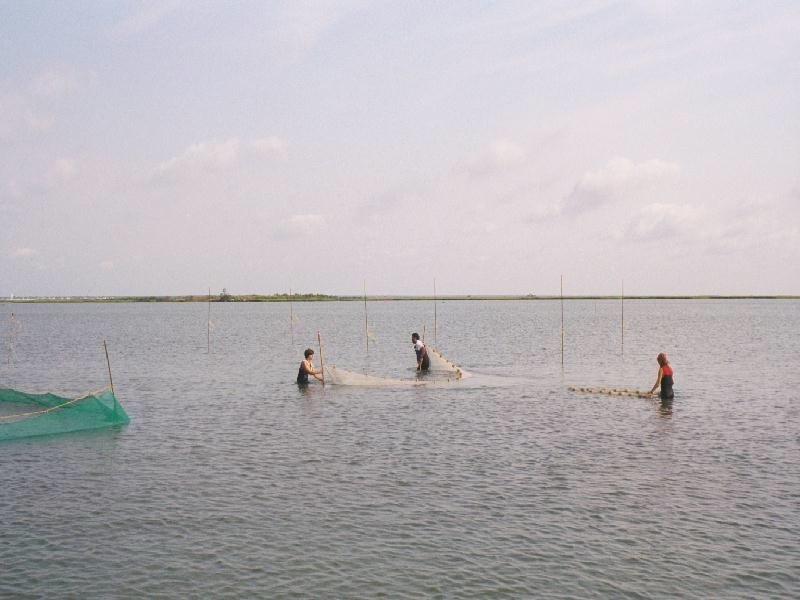 This page provides access to photographs, data and results from our MERP project. Rountree, R.A., F. Juanes. 2000. Click here to view pictures of unidentified specimens. (Click on thumbnails to view full size pictures). (027_10.jpg). 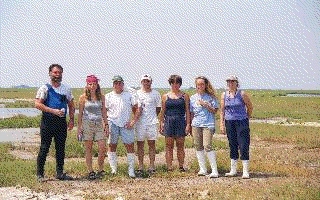 Some of the technicians and volunteers working on the project. From left to right: Dr. Rodney Rountree (P.I. ), Amy Graffum (volunteer/technician), Chris Grogan (technician), Dave Creque (technician), Stefanie Bergman (technician), Amy Rama (volunteer/technician), Patricia McGinn (volunteer). (merpvol1.gif). From left to right: Marja Roemer (volunteer), Rodney Rountree (P.I. ), Francis Juanes (Co.P.I. ), Chris Grogan (technician), Dave Creque (technician), and Amy Graffum (volunteer). (031_6.jpg). 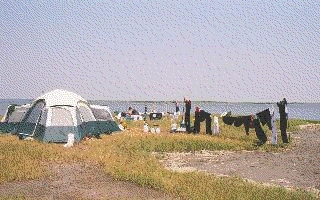 Camp site in the marsh where the study was collected. (merp2.gif). Map of study site. 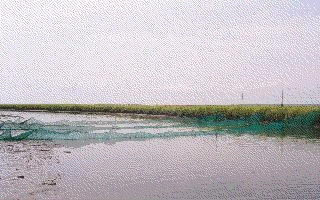 (A) Little Egg Harbor-Great Bay estuary indicating the location of the study site (1=New Creek, 2=Foxboro Creek, 3=Story Island Creek). (B) Detail of three study creeks indicating approximate location of habitat zones within each creek-to-bay coenocline. (foxair1.gif). Satellite views of the study area. (foxair3.gif). Satellite view of Foxboro Creek. (merp3.gif). A) Schematic of standardized seine sampling methodology developed in the project. 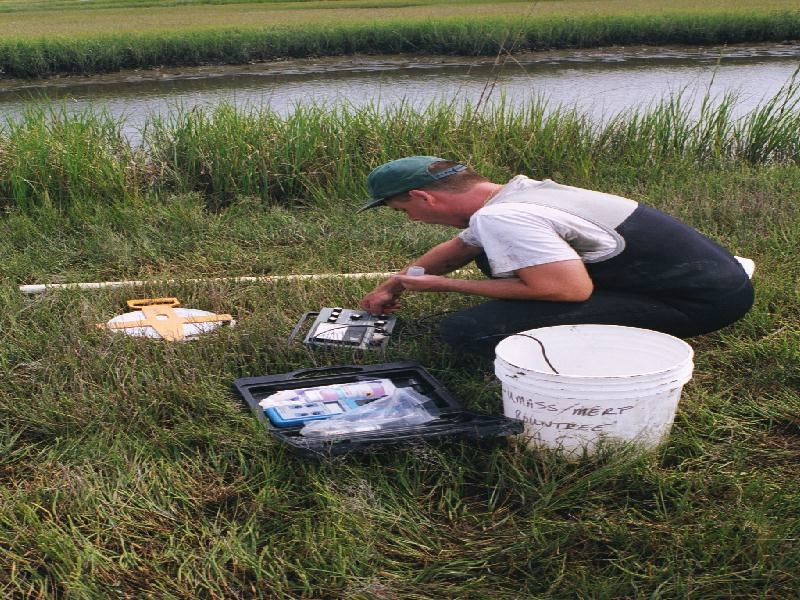 Prior to each sample event a pair of adjacent 5-m sections of the creek was randomly selected within each creek zone. 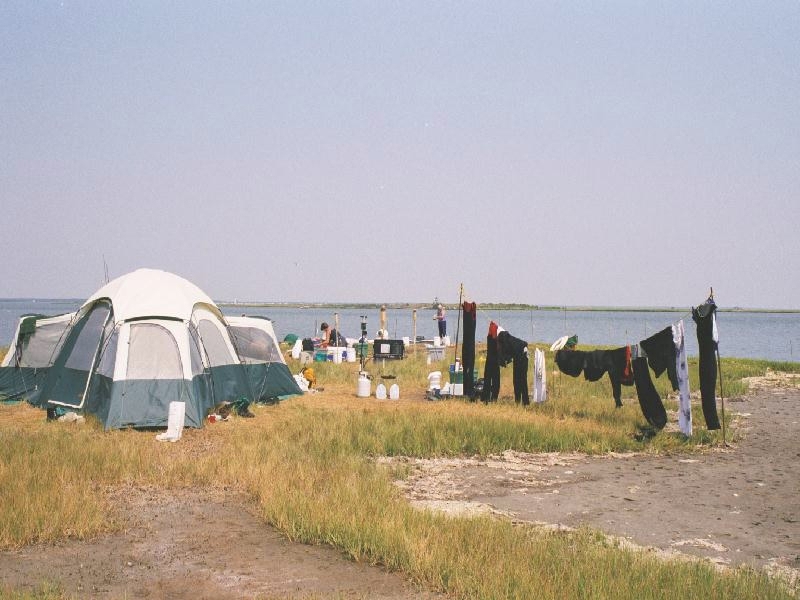 The site was prepped at high tide when stakes, clotheslines, and pull-ropes were set in place. 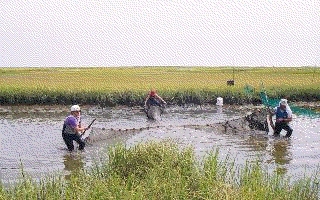 The pull-ropes were attached to block nets stored by the side of the creek. B) At low tide seine samples were collected within the blocked creek sections. (018_19a.jpg). 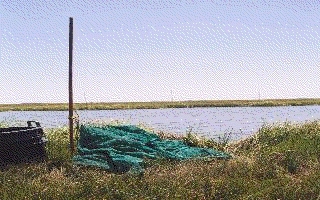 Photograph of a block net clipped onto the clothesline and stacked on the creek bank. (011_26a.jpg). 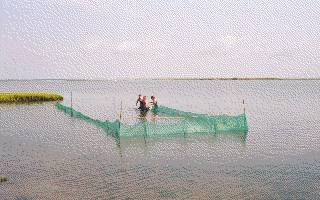 Block net set in place at high tide and ready to be pulled across to the other side at low tide. 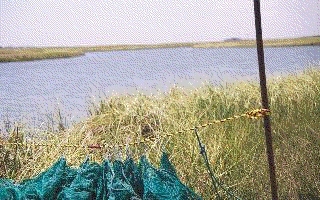 (merpset1.gif). 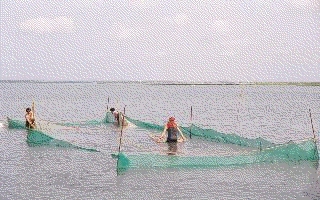 Setting nets. 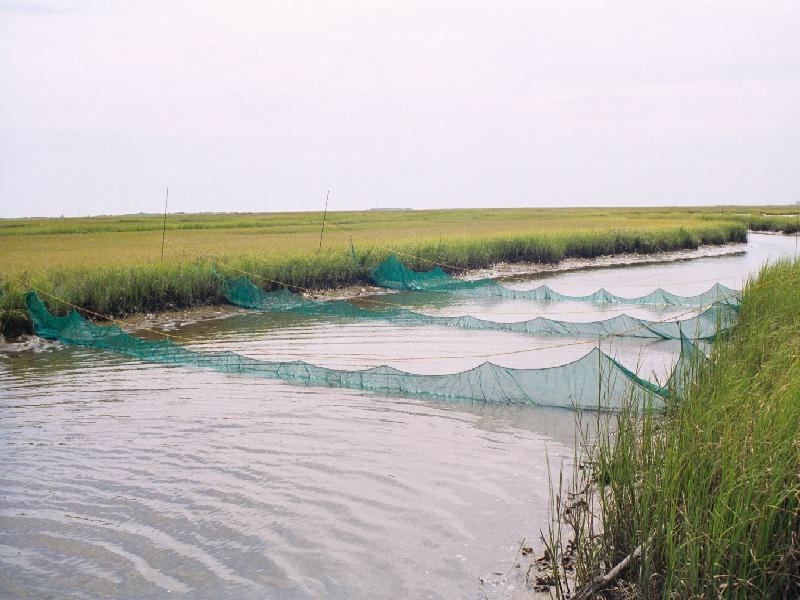 At low tide all three block nets were simultaneously deployed by pulling them across the creek like large "shower curtains". The biologists remained well back from the creek bank at all times, and waited quietly for 2 minutes prior to deployment to minimize fish disturbance. 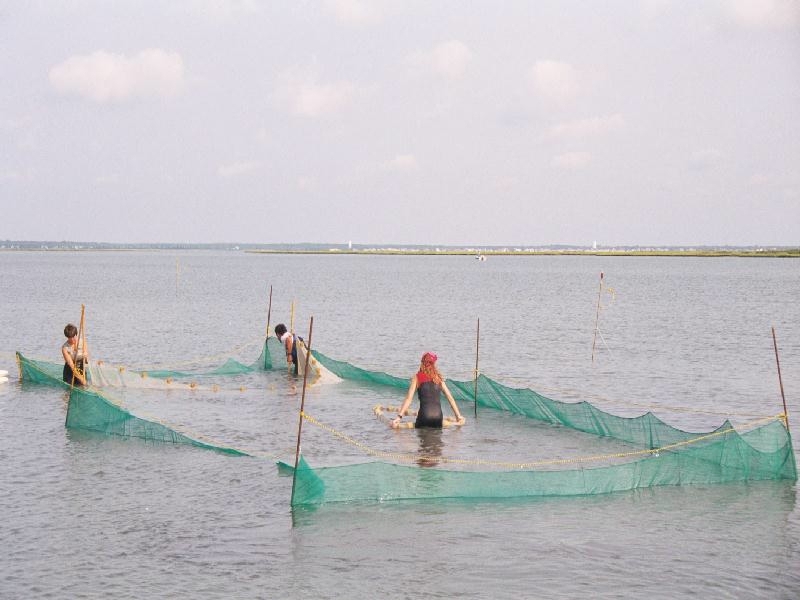 It took as little as 10 seconds, depending on creek width, to set the nets in this manner. (007_19.jpg). 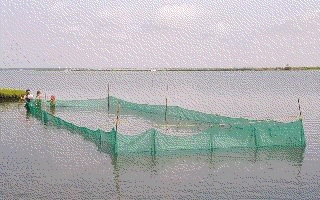 Three block nets deployed at low tide just prior to sampling. (025_1.jpg). 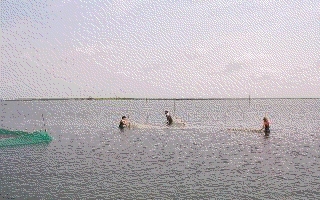 Three block nets deployed at low tide just prior to sampling. (005_21.jpg). 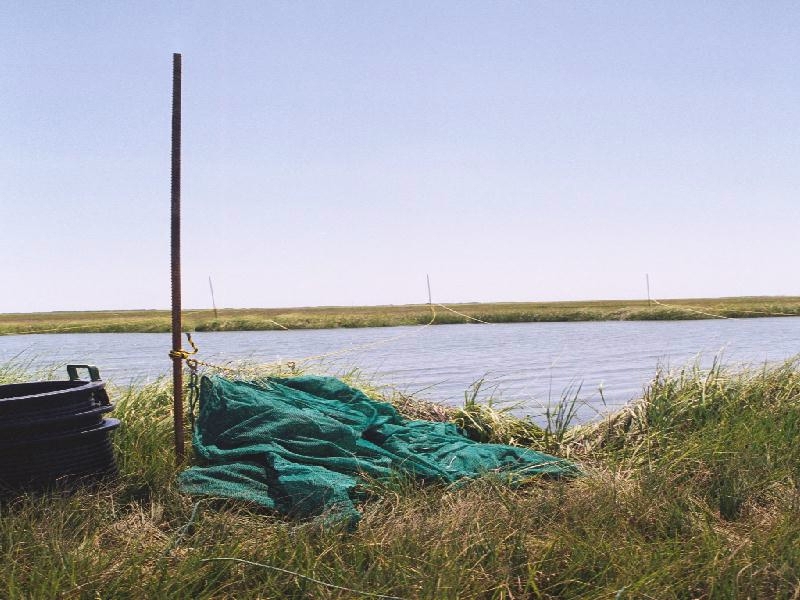 Once the block nets had been deployed, one team of biologists would begin collecting temperature, dissolved oxygen, salinity and creek depth profile data. (023_3.jpg). A second team of biologists began seining at the same time. 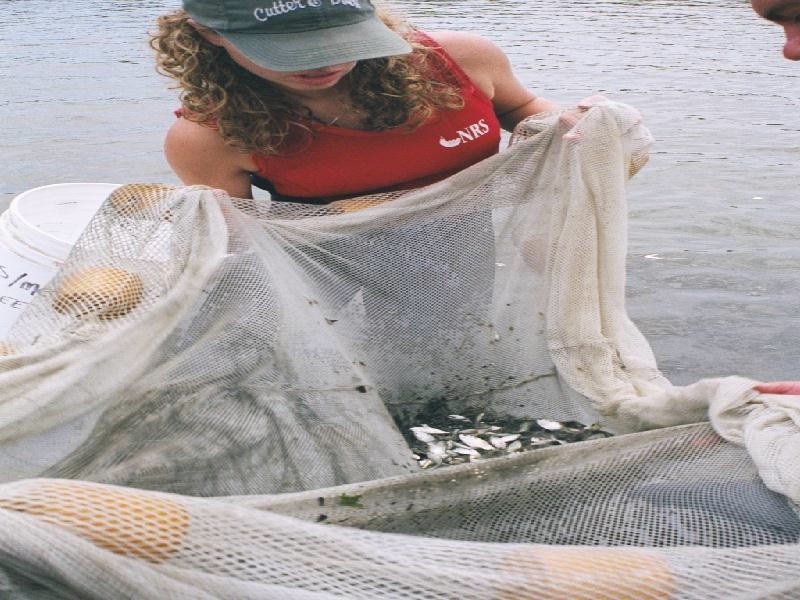 To obtain a comparison of catches obtained with our block net method with more conventional seine methods, we first made from 1 to 3 seine hauls in the creek just outside of the block nets. 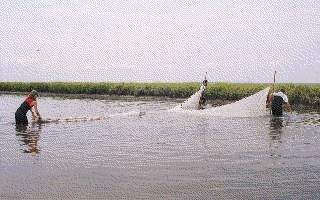 A restriction line was used to insure that a 5-m section of the creek was sampled. 021_5.jpg. A small mesh tunnel seine with attached live car was used in all sampling. (013_13.jpg). Because of the shallow water depth and narrow creek width, a third biologist was required to assist with the seine in order to keep the tunnel and live car open. (009_17.jpg). We feel the tunnel seine and live car combination was superior to the more commonly used bag seine, because fish and invertebrates were less like to be "herded" and quickly passed into the live car in an effort to escape the seine. (017_9.jpg). The large live car also made it easier to wash out the large amounts of mud hauled up by the seine. (merpmud1.gif). 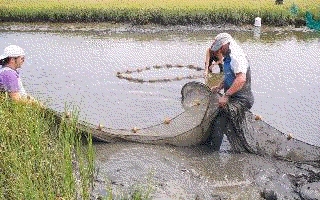 The catch was transferred to buckets and carried to shore for processing. Seining in the muddy creek was exhausting work! (mersein3.gif). Once seining on the outside of the block nets was completed, then three seine hauls were made within each of the two replicated 5 m creek sections enclosed by the block nets. 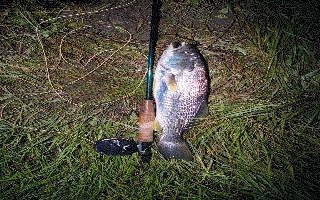 (007_31.jpg). 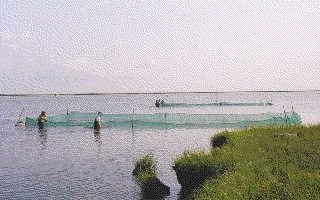 Sampling within the open bay zones required a different blocking technique. Steel stakes defining an approximately 5 m by 15-m rectangular area were set out at high tide. 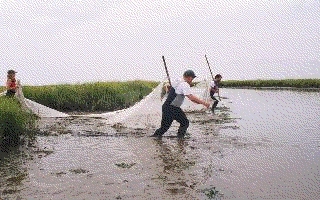 At low tide a team of biologists enclosed the area with a large block net, which was stored in a floating basket, by walking it around and tying it off to the stakes. 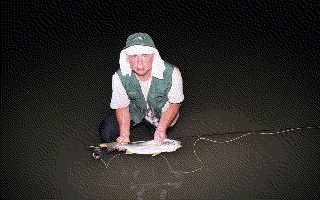 This photographs shows the operation after three sides had been completed. (005_33.jpg). 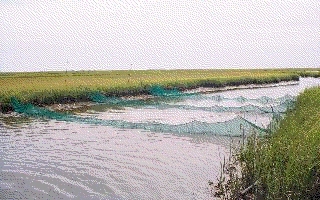 A block net placed just outside the creek mouth. (037_0.jpg). 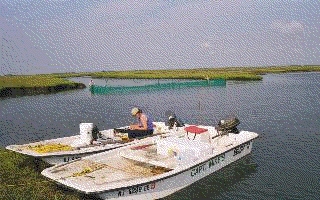 Two "replicate" block nets were deployed simultaneously in the bay just offshore of the creek by two teams of biologists. 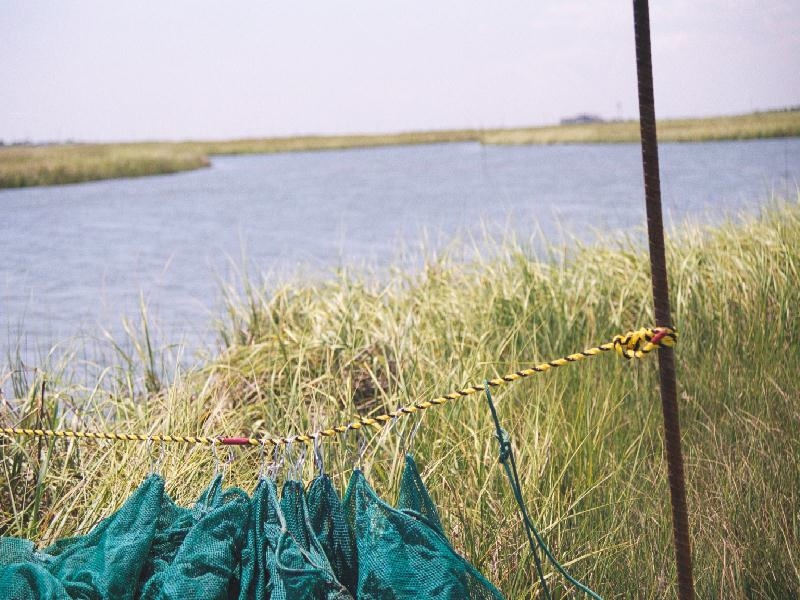 Because of the deployment method, we could not set the replicate block nets immediately adjacent to each other as we had done in the creeks. Specific locations of each block net were randomly determined. (035_2.jpg). Once the block nets had been deployed, one team of biologists immediately began seining a 5-m wide section of the bay outside of, and parallel to, one of the block nets to allow a comparison of catches with conventional seining techniques. (002_36.jpg). 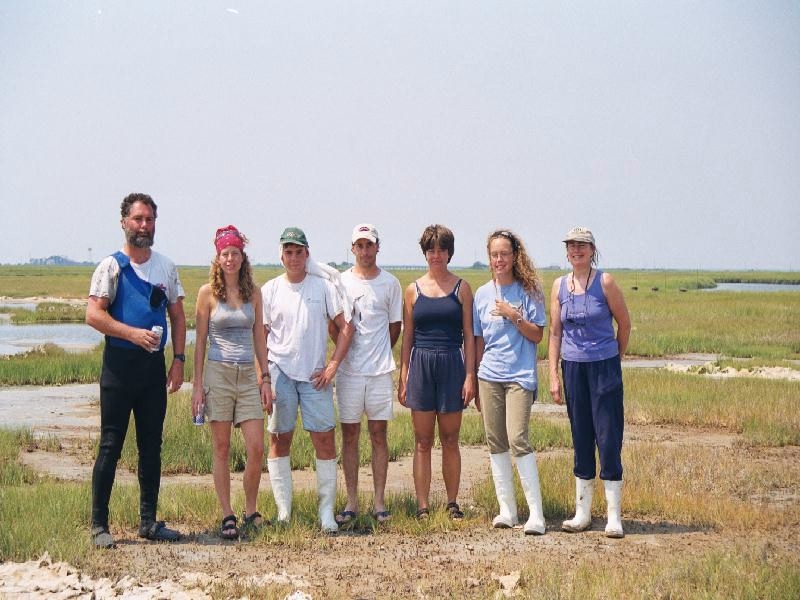 A second team of biologist simultaneously collected physical data and measured the depth profile of the sample area. (033_4.jpg). Seine samples were then collected within the block nets using the same methods employed in the creeks. (032_5a.jpg). Large schools of Atlantic silversides moved into the creeks at night, this attracted large predators such as this weakfish, Cynoscion regalis, which was caught in the creek by Chris Grogan. (031_6a.jpg). 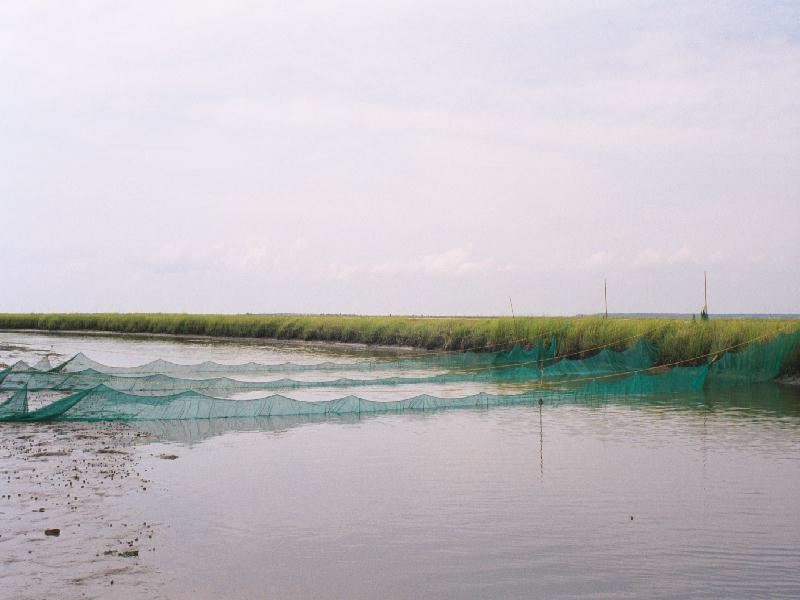 The weakfish would move into the creeks as soon as the tide began flooding in order to take advantage of the large low-tide concentrations of silversides. We observed them as far as 600 m up the creek and in only a few inches of water.